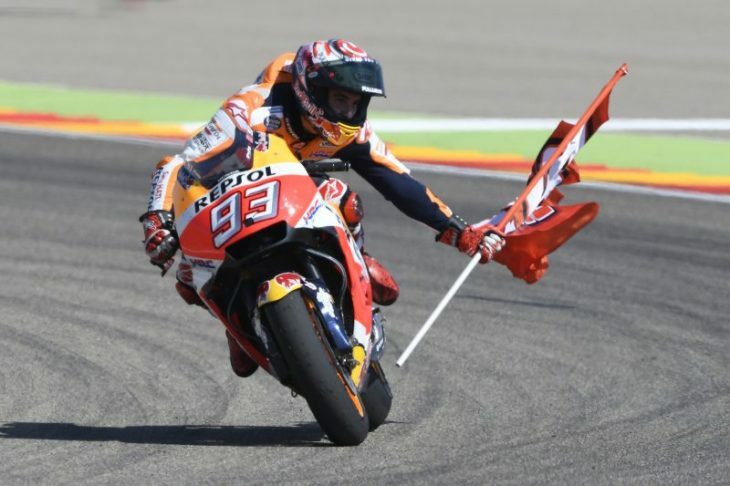 Honda’s Marc Marquez won the MotoGP race earlier today at the Aragón circuit, and took the outright lead in the World championship with four races remaining on the calendar. The other podium finishers included Marquez’ teammate Dani Pedrosa in second and Ducati’s Jorge Lorenzo in third. The big story during the race was the impressive performance of Yamaha’s Valentino Rossi, who had decided to race just 24 days after breaking two bones in his right leg. Rossi battled at the front most of the race, nipping at the heels of early leader Jorge Lorenzo until mid-race. Rossi ultimately finished in fifth position, less than a second behind teammate Maverick Viñales. Ducati’s Andrea Dovizioso, who shared the championship points lead with Marquez coming in to the race, struggled with tire wear, and eventually faded from the front group to finish in 7th position. The “MM On Parade” series is getting old. This’ll be his 4th Championship out of the last 5, for those not keeping track. This season started out pretty exciting. Ending, not so much. I wonder how many seasons of this boredom before there is potential of it costing Dorna actual money. The last race in the rain where the entire field practically gave it away to MM was a travesty. Looks like WSB is even more boring and predictable. So – not really in the racing as such? Because it has been stella. Regardless of the championship, the racing has been fantastic. And I tend to live race by race without much care as to who wins the championship. The fact that the championship points race has been so tight has just been icing on the cake. Marquez has the best chance of winning the championship, but even that isn’t set in stone just yet. There was a time when MotoGP was “Valentino on Parade,” and the series seemed to do just fine. Anyone see the video clip of Pedrosa passing Rossi? Either Rossi’s leg or elbow kicking out at Pedrosa at nearly 190 mph. hum…no wonder Pedrosa said something post race. Hmmmm . . . don’t let the shaft of that flag wander into your front wheel!!! Suprised Dovi was so far down. Zarco’s charms seem to have worn off. Rossi, the guy is nuts. Already rich, already has a cabinet full to trophys, chooses to race. Lorenzo in 3rd, that’s the shocker. Not from a career perspective, but certainly this year. Why wouldn’t Rossi race? He obviously enjoys it, is good at it, and as we saw 3 weeks ago its not more dangerous than the activities he likes to do anyways. Because A. MotoGp is the most dangerous thing he does, even if he got hurt doing something else(the great Randy Renfrow died falling down stairs..), and B. Had he hurt that leg again, he could’ve been hobbled for the rest of his life. Mick Doohan probably has some opinions about that..
Q: “Why wouldn’t Rossi race?” A: to hookup VDM. going into Aragon with 5 races to go Ross was 42 points down. now going into Motegi with 4 races to go Ross is 56 points down (hint this is NOT an improvement). see MATH doesn’t lie, despite best efforts and all the cheer-leading his situation actually got WORSE…!!! (OMG) yeah, welcome to the conundrum of “perception vs. reality”. Calm down, Normie (hint Coulda gone the other way). Unless he doesn’t race, then no points of course. however, by all means continue thinking happy thoughts. I assumed that Vrooom was asking why Rossi raced at all, not this particular race. Morbidelli! The guy has Marquez-like guts, determination, and skill. Yes, he gets my vote for most likely contender for Pedrosa’s seat if he impresses the brass in the premier class next year. perhaps the real hero of this race is Pedrosa. It was his race to lose and he chose to protect Marquez’s rear. What are you talking about? He barely got within 2 seconds of Marquez who most likely was managing the gap. Pedrosa himself mentioned after the race it took him too long to get around Vinales. sounds like sour grapes from years past, Pat S. Face it, Rossi lost. Further proof that these guys (not just Rossi) are different than the rest of us was highlighted in the pre-weeekend press conference, where Rossi described his surgery as being no different than what “normal people” would get. Maybe a little bit lost in the translation, but still very clear that he’s not normal. There you go Mickey, your man making the podium once again. Still life in Pedrosa. Yea baby, great race for Dani, but once again after last weeks disasterous race, when even guys that crashed beat him, it doesn’t really mean much ( toward the championship). Great ride though. Lorenzo is starting to figure it out. I thought there was no way he was going to win a race this season, but it may just happen. Marquez is fearless, that one time about 3 laps from the end when his bike got out of shape drew an involuntary gasp from me, but he just kept on the gas. Crazy. The kid has skills and heart. Speaking of heart, Rossi is not human. What an inspiring performance. He held onto second so long, only to fade at the end. Impressive. Glad for Lorenzo but today would have rather seen Rossi in the podium ceremony. here’s a story bigger than both Ross and Murguez, see Wikipedia entry for “DISASTER”.